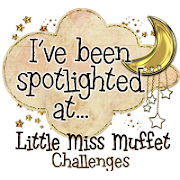 This week at Fairy Fun Fridays the challenge is Inspired by a Song. For this card I really played with three different images from Prairie Fairy Designs, Valentine Gillian Set (the drummer), Dr. Kinsley (Robert Palmer) and Gillian at the Beach for the guitarists and keyboard player. I altered their hair, clothes, no glasses or hat in my Photoshop Elements. I used the Addicted to Love video by Robert Palmer for inspiration and tried to make it as close as possible including the background. The instruments are clip art from online and the microphone and alterations are hand drawn. Hope you follow my weird sense of humour! For this card I used the Pretty Gillian image and gave her red high heels. Enter the challenge and have the opportunity to win some fab prizes that the Prairie Fairy is offering. you made a perfect card with that sweet Gillian on her red high heels....enjoy your weekend! OMG how excellent! What a perfect song!! Way to go Kelly! Gillian is gorgeous! Have a great wknd! Thanks also for joining us at Stamps R Us this week! Fabulous job of altering the images - it's one of the great things about digital, isn't it? Great cards. Thanks for joining the One Stitch at a Time challenge this week. Such a cute card! Love the heels! Thanks for playing the DTC this week. Cute card! 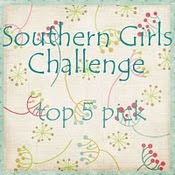 Thanks for joining us this week at KKKG's challenge. 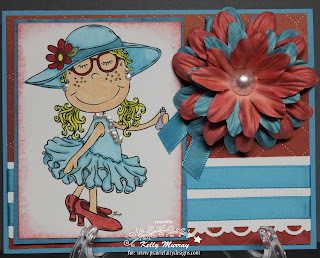 Hi Kelly...forgot to say that the first card is TDF....soooo great what you did whith altering the images!!! I love the colours you have used on the second one - what a great image and that big flower is just lovely!! Thanks for joining us over at Lexi's Creations this fortnight in our 'Flowers' challenge - good luck. Kelly, your cards are so cool. The Robert Palmer one is totally amazing. HOW CLEVER!! I just love it. Wonderful card and great colour choice. Thanks for playing with Charisma this week. Good luck. So much fun !! Great cards. Love 'em. Thanks for joining us this week at DYSU. Thanks for playing along at LC’s this time & good luck. Supercool! Thanks for joining us at Do You Stack Up. How cute is she?! Thanks for playing in our challenge at Stamps R Us!